The walking's easy on this route; it's all about the views. A circular walk from Speeton North Yorkshire to Hunmanby Gap alond footpaths and sands. 9 mile circular route from either railway station on 'the other side of the line'. The Campsie Fells make for a great day trip from Glasgow. Once again I am drawn to Betws-y-Coed, it is so nice there. This walk in southwest London follows the River Crane from Twickenham to Feltham. This is less of a fixed route, more a summons to a great little corner of the Lakes. This is a very pleasant and easy walk. This short walk takes in a very enjoyable corner of Ashdown Forest. The Jurassic Coast is a World Heritage Site and there's no better way to explore than by foot. A full day 10-mile circular walk on the West Pennine moors from Chorley railway station. This coastal walk explores the wild western coast of Cumbria. Start at Corfe Mullen Central Avenue. Mid-Wales and the Marches are glorious walking territory. Approx 8 mile walk taking in two waterfalls of quite different variety. The Simonside hills are steeped in legend. Being a collection of islands, Britain is spoilt when it comes to coastal scenery. A relatively flat, circular trip around Dufton Pike. A walk from Glossop on to Shelf Moor in the Peak District. A remote walk for those who love Scotland's wildest places. A 12 mile circular route from Buckden along well defined RoW's. A walk from the stunning town of Dartmouth over to Stoke Fleming. This route on the Norfolk coast explores Snettisham Nature Reserve. This walk takes in some of the southerly tops of Dartmoor. 7.5 mile walk along Calderdale Greenways (converted disused railway lines) & canal towpath. Marazion has frequent buses from Penzance. A short stroll in the heart of the White Peak, the southern half of the Peak District. The walk begins with a steep climb to the monument above Corwen. The Pembrokeshire Coast Path, one of the National Trails, lies mainly within the National Park. Ben Vorlich is a pleasant mountain near Ardlui Station. This walk takes you around historic Steeple Ashton. The Dorset countryside is marvellous for walking. This walk follows the coastline along the Moray Firth. This walk covers the countryside on the Wiltshire-Dorset border, above Cranbourne Chase. 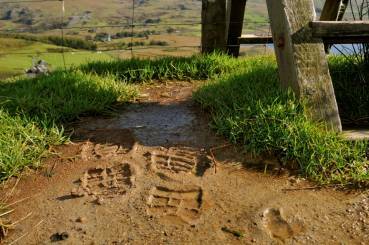 A three-day Lake District walk covering a wide area. The Ardnish peninsula is a great place to explore. This walk in Suffolk connects two stations on the East Suffolk Line. Fairly simple but pleasant amble to a prominent local monument. This walk follows two rivers - the Avon and the Frome. A country stroll ideal for a Sunday afternoon, less than an hour's train ride from London. From Storey Arms, you head east up to the Brecon Beacons, right? Along the coastal edge of Thanet and as far up as Whitstable, past Reculver. This walk takes in a superb stretch of the Cornish coastline. This is a fab walk for pre-high school kids of about 4 miles (but see note in Waypoint 10). This two-day walk must rank as one of Scotland's finest. A circular walk from Wem station, passing two historic halls. Many walkers pass straight through Kendal and head for the inviting peaks of the Lake District. This Hertfordshire walk takes in an enjoyable stretch of the Grand Union Canal in Hertfordshire. A country side walk from one of Leeds country parks. This walk circuits the Surrey town of Reigate.